Child friendly? The Sorcerer’s Apprentice tells the story of a young man named Dave Stutler who is recruited to help a master sorcerer named Balthazar defend himself from his evil nemesis. After learning the ways of magic and spells, Dave and Balthazar join forces to put an end to sinister forces. The film, which is said to have been based on a scene from the infamous Disney film Fantasia, is full of fast-paced special effects and contains scenes with mild fantasy action and some swearing. Recommended for children ages 8 and up. It’s the summer, so popcorn flicks are plentiful at the moment. Heavy on the action and light on plot, these films often don’t promise much. You expect to be wowed by the CGI and explosions, and if a few meaningful lines of dialogue pop here and there, well, count yourself lucky. So it should come to no surprise that The Sorcerer’s Apprentice is the paramount example of such a movie. The film was produced by Jerry Bruckheimer and was directed by Jon Turteltaub, the mastermind behind the emotionally-frail but relatively large spectacle known as National Treasure. 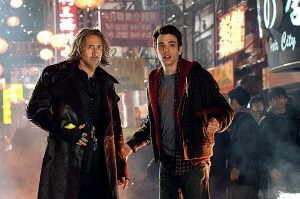 It has a big name on its billing (Nicolas Cage) and a witty, CGI-packed trailer, and that’s all she wrote. The Sorcerer’s Apprentice begins, naturally, with a prologue. Balthazar (Cage), a good-natured magician, has been fighting for centuries with the evil witch Morgana Le Fay (Alice Krige) and Horvath (Alfred Molina). One day, Merlin seals them in a nesting doll and as long as they stay there, the world is protected. The story continues in the present day, where Dave Stutler (Jay Baruchel) suddenly discovers he’s the Prime Merlinian, a descendent of the great Merlin the Magician. However, when he meets Balthazar and accidentally releases the evil forces from the doll, the sorcerer and his apprentice must join together to save the world. Sound confusing? Not so much. Truth be told, The Sorcerer’s Apprentice is about as challenging for the mind as an episode of "Jersey Shore." Still, kids will love the action, and adults might enjoy seeing Cage in a nappy blonde wig.